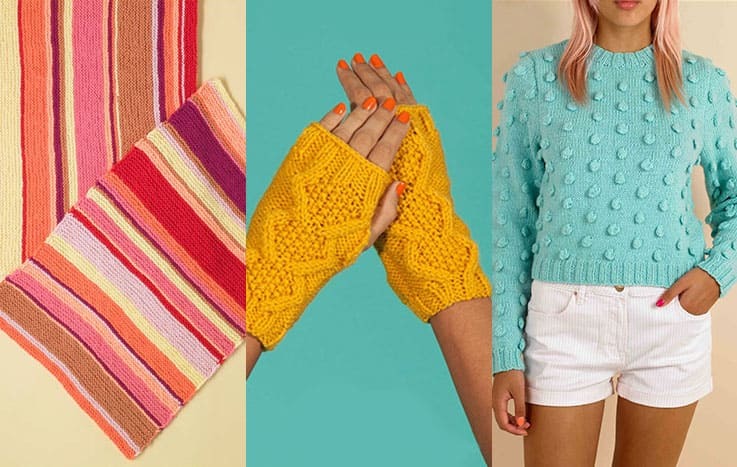 Easy on the hands, loom knitting is the craft technique of using a loom instead of needles to create beautiful knitted fabric, which can be transformed into sublime homeware, fashions and cozy accessories. While using a loom might look fiddly business, loom knitting is surprisingly easy when you know how, and is even great for kids! 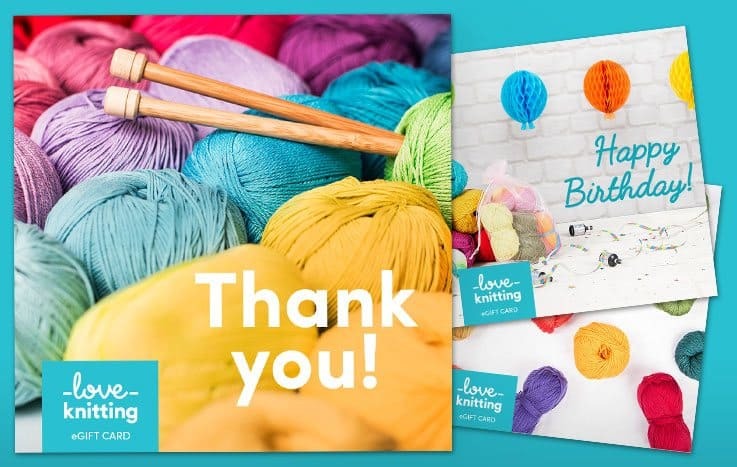 In this beginner’s loom knitting guide we’ll introduce you to the wonderful world of knitting looms, give you a tour of some essential stitches and even get you started on your first pattern. Unlock the joys of going needleless! What is a knitting loom? The iconic ‘loom’, which simply refers to the crafty contraption used to weave together yarn (or thread) to produce fabric, has widespread origins from Europe in the Middle Ages to the intricate craftwork of the Amerindian tribes of the Americas. Today, loom knitting remains a celebrated technique that can be used to create anything from gorgeous wall hangings, hats, scarfs, afghans and beyond! 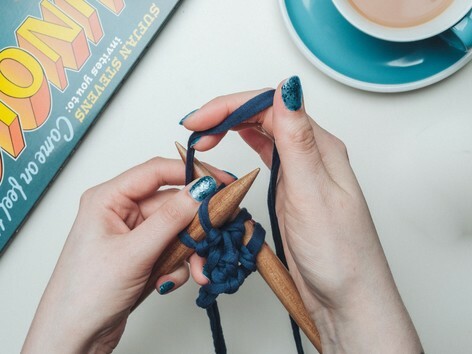 Loom knitting is especially brilliant for those who experience sore hands, such as those with arthritis or carpal tunnel syndrome. It’s also a wonderful alternative for those who simply favor a needleless approach to their projects, not to mention that the technique is incredibly fast so you can whip up marvellous creations in record time. With a variety of knitting looms and a broad spectrum of techniques available, loom knitting provides the basis to create diverse and showstopping projects. But first, let’s talk looms. There are many varieties of loom available depending of the project you’re embarking on. While rake (long) looms are excellent for flat panel projects such as blankets, circular looms are joyously compatible with hats and cowls. Here are some of the types of loom you are likely to encounter on your loom knitting adventure! Rake looms, also known as long looms, are characterized by a single row of pegs, generally used to create flat panel projects such as afghans and scarves from single knitting. When two rakes are set aside one another you then have what as known as a knitting board. Some rake looms on the market may include two rows with an additional peg on either end of the loom allowing you to work in the round if you so wish. Just like regular knitting, fabric produced from a simple rake loom will have a knit side and purl side. The gauge of the long knitting loom is determined by the distance between each pin, so the closer together your pins the finer your knitted fabric! Round knitting looms refer to a loom where there is no stopping point, unlike its cousin the rake. A round knitting loom is any device where you can continuously weave, this might appear in a menagerie of wonderful shapes and sizes, including circular, oval, square, triangular and even heart-shaped looms. 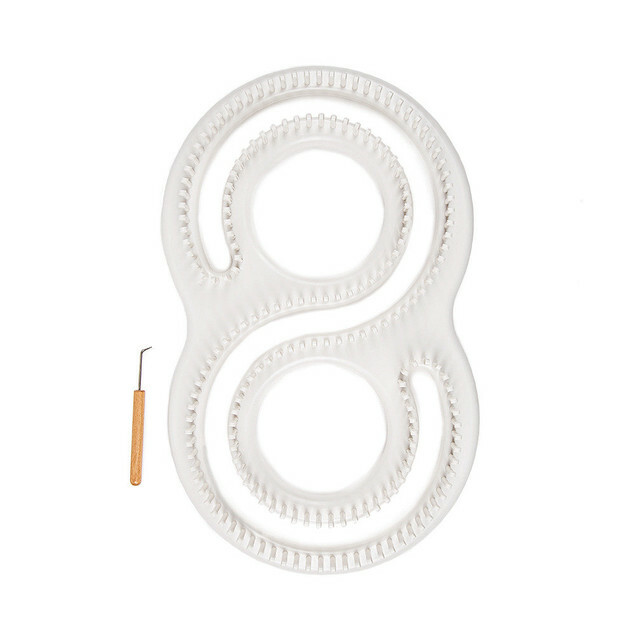 Round loom knitting projects are often (but not exclusively) tubular shaped because of ability to continuously knit in the round, which means if you’re looking to make socks, sleeves or cowls, or anything that might have a tube or circle shape - round looms are a must! 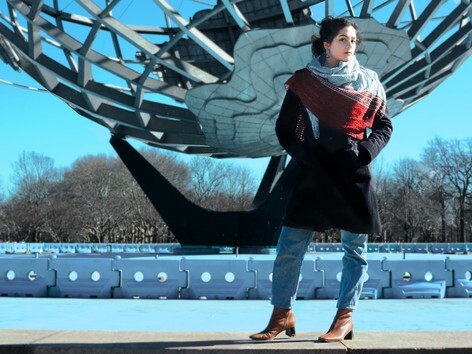 S-loom, or the serenity loom, has an ‘infinity’ figure of eight structure, and is the perfect knitting loom for crafting large panels of fabric which can be sewn together to create dreamy afghans and blankets. Sock looms include an adjustable gauge so you can easily create increases and decreases to knit the perfect size for your whole family, whether you’re creating grown up socks or baby booties. Loom weaving is a fiber craft that is distinctive from loom knitting. The weaving loom, unlike knitting loom, doesn’t have pegs and instead facilitates a series of warped threads, that you can use as a framework to weave in your yarn. The weaving loom produces stunning wall hangings and tapestry. 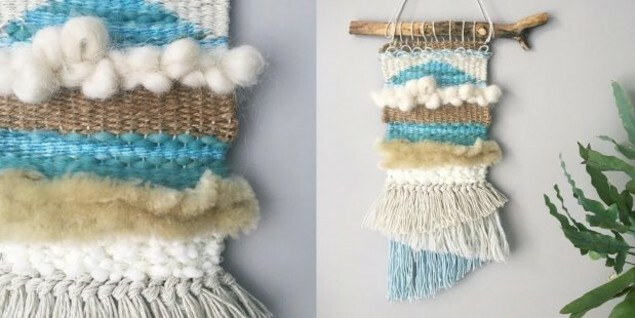 If loom weaving tickles your fancy why not try your hand at this free wall hanging tutorial by Christine Leech. Your favorite knitting stitches can be created on your loom according to how you wrap the yarn around the pegs. Different wrapping techniques will produce different textures and designs to produce satisfyingly plush projects from traditional stitches to more intricate styles including lace or cablework. Anything is possible with a loom and a little know-how! It’s important to bear in mind often loom knitting stitches have different names to those created by needles. 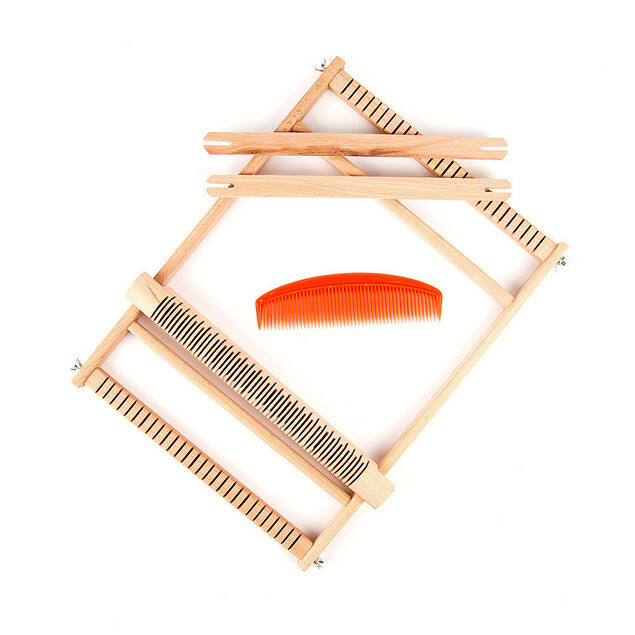 Knitting looms come in a variety of shapes and sizes depending on what kind of project you are making. While long looms work best for projects like scarves, round (or circular) looms are best for hats, socks or anything that has a tube structure. Let’s get down to basics. 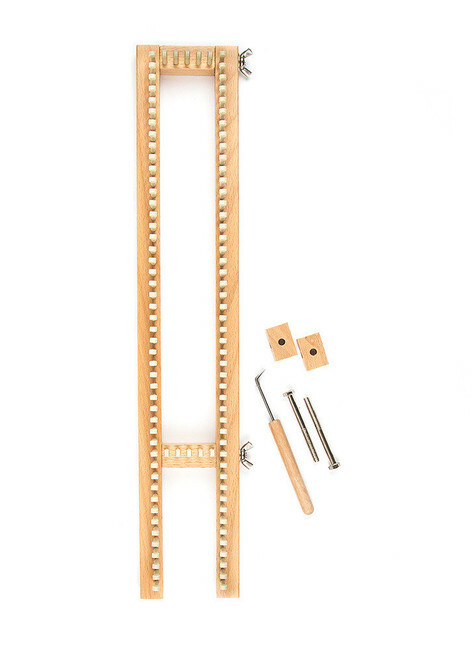 The anatomy of a loom is made up of three essential components; base, pegs and gauge. The base is the frame at the bottom of your loom which might be a long or round available in lots of sizes. The pegs describe the multiple short pins attached to the base - sometimes these are just called pins. The gauge is the distance between each peg (or pin), the wider the gap is between the pegs the greater the gauge. Easy-peasy! So what determines the size of your project? The size of your project can be affected by many things, the first is the size of your loom. Many fledgling loom knitters refer to the size of the loom as the number of pegs, but this is a massive no-no! As a beginner it’s important to remember that it’s actually the size of the base that determines the size of your project, not necessarily the number of pegs. The number of pegs and the gauge influence the tension of your stitches, or how tightly knit together your stitches are. More pegs does not necessarily mean a bigger size. Saying that, there is one exception - and that is the style of stitch. If you use a loose stitch such as an Ewrap stitch then your fabric will be looser and therefore be a slightly bigger size then if you were to use a garter stitch on your loom. When it comes to the number of rows and pegs on your loom knitting project, it’s important to remember that these are not interchangeable. The peg count determines the circumference or width of your project, and the number of rows is how many times you repeat this. If you are making a tubular project such as socks or a hat on a round loom, then the rows will only add to the length of the tube, but not give anymore give around the foot or head. 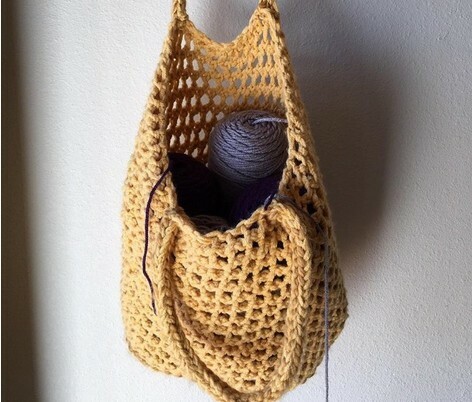 In addition to your loom and yarn you will also need a hook to catch and pull your loops of yarn over to create the knitted stitches. Just like knitting with needles, loom knitting includes a whole encyclopedia of stitches to craft beautifully textured knitwear. Before we get to specific stitches, there are two fundamental methods of knitting on a loom: single and double knitting. Single-knitting is when you knit stitches on pegs next to one another, creating a fabric which will have a ‘right’ and ‘wrong’ side. The knit stitch on a loom has the very same texture and look as a knit stitch created using regular needles. 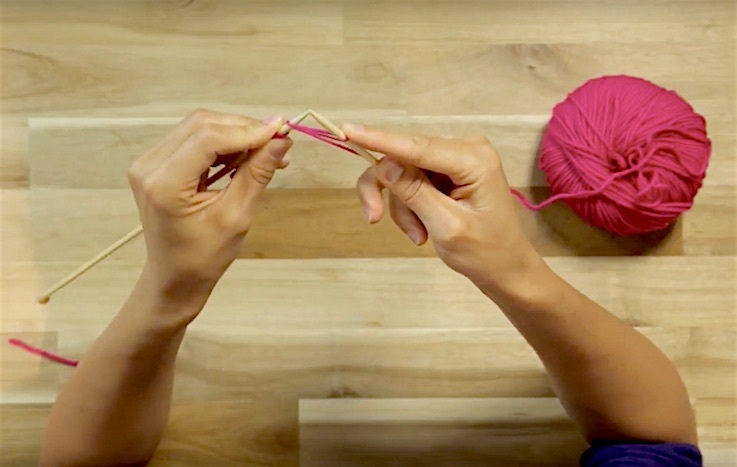 The knit stitch is achieved by using your hook to pull at the yarn looped around your peg, to create a new loop. By lifting the old loop up and over, you replace with the new loop on your peg to create a new knit stitch. And that’s it! 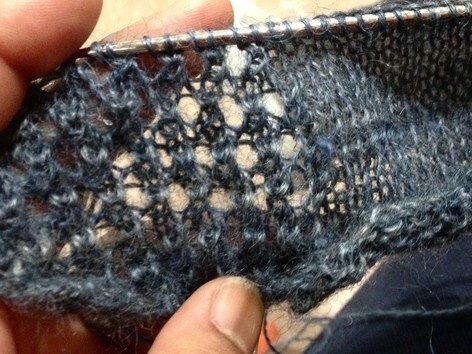 This is the primal stitch that once mastered can be combined with purl to create garter stitch or even ribbed stitches. Flat stitch is a close cousin of knit stitch, except it’s tighter more compact. Stretch the working yarn across the top loop of the peg and simply use your hook to lift the bottom loop over and off your peg, securing the working yarn in place by making it a new loop. Just like in traditional knitting, the purl stitch is the reverse of the knit stitch, meaning that the backside of your fabric will be knit material the frontside will be purl. 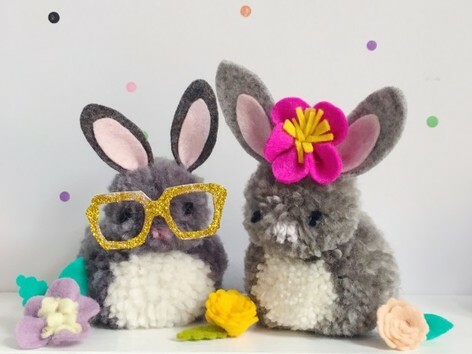 Both knit and purl stitches are fantastic starting points to launch you into a world of glorious textures and designs as you learn to loom knit. Double-knitting is when you knit across two rails, if you are using a long loom, so you have a front and a back peg, meaning you get the same texture on both sides of your fabric. In loom knitting this might be referred to as a flat (stockinette) stitch, and when knitting with needles this is known as the basic knit stitch (k). 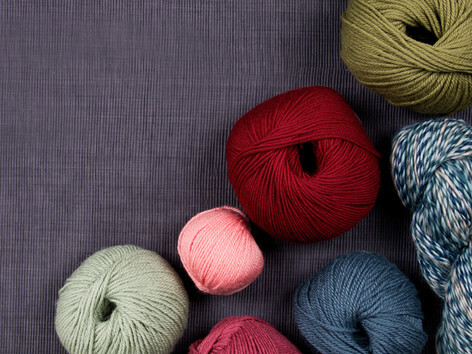 Just like the gorgeous basic fabric produced when knitting with needles, the no wrap stitch creates sturdy yet beautifully adaptable material which can be transformed into fabulous accessories and homeware. As one of the most basic stitches, the no wrap stitch is a staple for the avid loom knitter and can be used on a long loom or round one. And that’s a wrap! Better known as the twisted stockinette stitch when knitting with needles (tw St st), the ewrap works a treat on both long and round looms. Perfect for gloves and garments with the iconic ribbed effect, the single ribbed stitch sees ewrap stitches alternate with purl stitches on each row creating glorious ridges of yarn. Time for the fun bit: choosing a project! Let’s talk through some of the most popular kinds of loom knitting projects, beautiful patterns and essential tips to get you started. When loom knitting a hat opt for a round (circular or oval) loom. 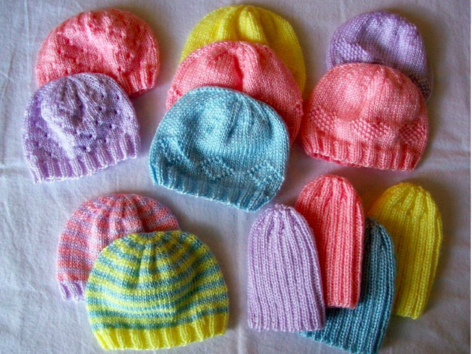 Perfect for crafting plush beanies, slouchy hats, and snug toppers for the whole family! 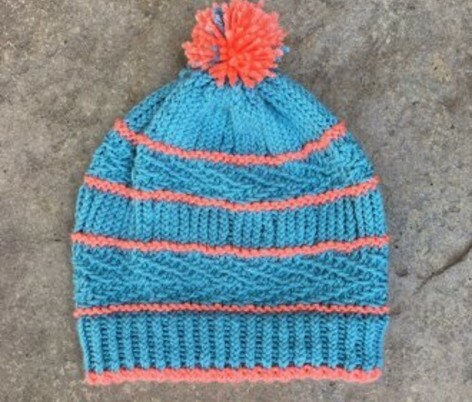 A hat is a great beginner project on your loom adventure, especially if you pick a nice chunky yarn to get you started. Our hat loom knitting chart below will tell you what loom size to use depending on who you are making your hat for. Planning knitting a scarf with your new loom knowledge?All you need to do is get your hands on a long loom (a rake loom), some super snuggly yarn and pick a pattern! What you waiting for? There are many ways you can knit a blanket using a loom. One method, particularly handy when you’re on the go, is by using a small round or long loom to knit panels of knitted fabric which you can later sew together to make a cozy blanket. This is a treat if you like working with different colored panels or stitches to build a beautiful patchwork statement throw or afghan. 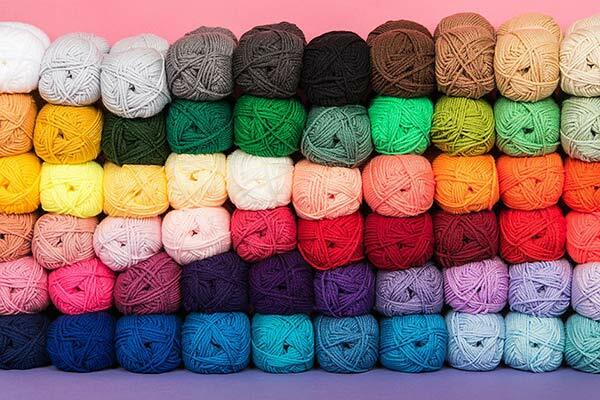 If you would prefer to loom knit a blanket made by a single piece of fabric or make larger panels that can be sewn together, then you can do no better than investing in an Afghan loom (s-loom), whose ‘s’ or infinity shape is designed to produce wider bigger panels purely for the joy of making larger snuggly knitted fabric. Many people prefer to make socks using a loom as they find it less fiddly than needles, with the same gorgeous results! We recommend single knitting using a round loom. Many bespoke sock looms have an adjustable gage so you can customize the size of your sock for the perfect fit, from soft baby patterns to hiking socks. You can start from the toe up, or choose to work down from the cuff. To get started all you need to do get a scrumptious yarn in a shade you love and explore our sock patterns! Although the digital pattern world is great for time-saving sumptuous patterns at your fingertips, nothing beats sitting down with a nice cuppa and leafing through patterns which can be made using your favorite craft. Loom knitting books such as Isela Phelps’ Loom Knitting for Babies and Toddlers is packed with inspiration and instructions to make adorable knitwear for your little ones using a loom.